The PhD project on solar charging of electric vehicles will be demonstrated at the TU Delft Research Exhibition Dig-it: the largest science expo of the Netherlands. A Nissan leaf EV will be charged from solar panels and discharged using Vehilce-to-grid (V2G) technology with the developed 10kW solar powered bidirectional EV charger. The project and demo is collaboration with Power Research Electronics, Breda and Last Mile Solutions, Rotterdam. Supported by Nissan, ABB, UT Austin. Funded by TKI switch2smart grids and PIB initiative, Netherlands. However there are many bottlenecks for the emergence of these two technologies. Electric vehicles are only ‘green’ as long as the source of electricity is ‘green’ as well. If the electricity for the vehicle comes from a thermal power plant, its no-longer a clean transportation method. PV power production suffers from variation in sunlight on a daily and seasonal basis. This necessitates the need for battery storage technology which is bulky and expensive. Requirement of EV customers to have quick charging i.e. be able to charge the electric vehicle in short span of time in the order of a few min. The EV-PV project aims at combining the two technologies by creating an electric vehicle charging infrastructure using PV panels. The focus is to reduce the energy demand on the grid due to electric vehicles by locally producing the charging power in a ‘green’ manner through solar panels. The EV battery doubles up as an energy storage mechanism for the PV system. A power converter will connect the EV, the solar panels and the electricity grid providing both normal and fast charging for the customers in a safe and reliable manner. Smart charging algorithms will ensure that the EVs are optimally charged based on EV user requirements, distribution network constraints, energy prices, demand for ancillary services and solar forecast information. The Project is a collaboration of the Department of Electrical Sustainable Energy and Faculty of Industrial Design Engineering of TU Delft, Power Research Electronics, Last Mile Solutions, ABB EV charging infrastructure and University of Texas at Austin. G.R. Chandra Mouli, P. Bauer, and M. Zeman, "System design for a solar powered electric vehicle charging station for workplaces." Applied Energy168 (2016): 434-443.
van der Meer, Dennis, Gautham Ram Chandra Mouli, German Morales-Espana, Laura Ramirez Elizondo, and Pavol Bauer. 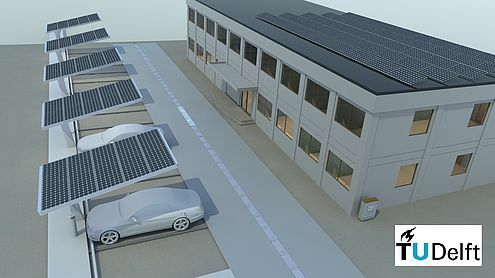 "Energy Management System with PV Power Forecast to Optimally Charge EVs at the Workplace." IEEE Transactions on Industrial Informatics (2016). G.R. Chandra Mouli, J. Kaptein, P. Bauer and M. Zeman, "Implementation of dynamic charging and V2G using Chademo and CCS/Combo DC charging standard." 2016 IEEE Transportation Electrification Conference and Expo (ITEC). IEEE, 2016. G.R. Chandra Mouli, Mark Leendertse, Venugopal Prasanth, Pavol Bauer, Sacha Silvester, Stefan van de Geer, and Miro Zeman. "Economic and CO2 emission benefits of a solar powered electric vehicle charging station for workplaces in the Netherlands." In 2016 IEEE Transportation Electrification Conference and Expo (ITEC), pp. 1-7. IEEE, 2016. Ashok, Vijay Vasan, Gautham Ram Chandra Mouli, Jos van der Burgt, Santiago Peñate Vera, Martijn Huibers, Laura Ramirez Elizondo, and Pavol Bauer. 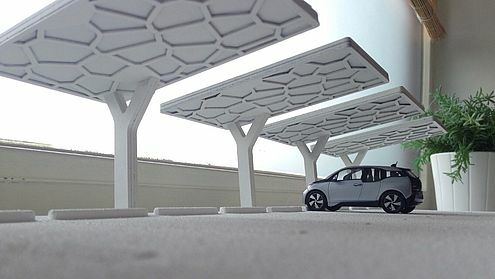 "Using dedicated EV charging areas to resolve grid violations caused by renewable energy generation." In 2016 IEEE Transportation Electrification Conference and Expo (ITEC), pp. 1-6. IEEE, 2016. Mouli, Gautham Ram Chandra, Jos Schijffelen, Pavol Bauer, and Miro Zeman. "Estimation of ripple and inductance roll off when using powdered iron core inductors." In PCIM Europe 2016; International Exhibition and Conference for Power Electronics, Intelligent Motion, Renewable Energy and Energy Management, pp. 1-8. VDE, 2016.